The federal government has been talking about green energy and energy efficiency for years, but in the past few years, it has taken real steps to show just how serious it is about the environment. Now, the government is putting its money where its mouth is. The government has introduced and expanded several incentive programs for both homeowners and businesses to encourage the adoption of green energy, encourage energy efficiency, and to help subsidize the cost of retrofits to make it all possible. It has even gone to great lengths to ensure that its own operations in federal buildings are getting greener. Now, the government is taking it one step further, and reaffirming its commitment to the environment by taking it to the military. In May, the Pentagon awarded over $19 billion in green energy contracts, and the U.S. Defense Department launched a renewable energy program to reduce the military’s dependence on fossil fuels. The companies involved will be eligible to build geothermal projects on or close to military bases and units. In addition to wind, solar and biomass energy generation, projects would include those that generate power from heat produced by the Earth’s core. The work is cutting edge, and the government is taking full advantage of it. In addition to cementing the administration’s commitment to sustainable energy, these new projects will also increase the military’s energy security by keeping it home-grown instead of relying on foreign sources for energy. In 2012, President Obama set a target of generating renewable energy on military bases that would equal the power of 750,000 homes by 2025. 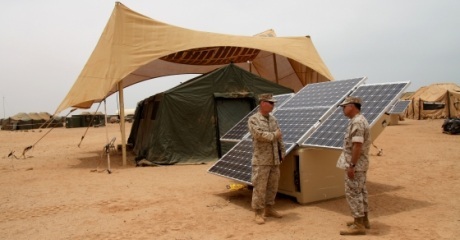 The Pentagon has its own goal to get 25% of its energy from renewable sources by 2025. In 2011, the Defense Department had a goal of getting 12% of its energy from renewable resources, but missed it, and only achieved 8.5%. But this hasn’t slowed them down. The government continues to pursue aggressive, but achievable, targets in green energy, conservation and energy efficiency. Right now there are two bi-partisan pieces of legislation in Congress - the SAVE Act and the HOMES Act - that, if passed, would create energy efficient mortgages (where the energy efficiency of the home is factored into the mortgage) and set up a substantial rebate program for home upgrades that save energy. Contact your local Building Energy Pros affiliate or call Building Energy Pros at 1-800-309-6006 to learn more about the current rebates available, and those on the horizon.